Branch was recently invited to participate in a competition to redesign San Francisco's JCDecaux public toilets and kiosks. Since its founding, San Francisco has had nearly 250 years to define an iconic aesthetic, recognized and remembered around the world. Yet now more than ever, the look of the city is changing and evolving. As we explored how the new design for the JCDecaux Public Toilets and Kiosk intersects with this evolving city, we strove to create modern, welcoming structures that blend in but also help define the look of the San Francisco of the future. All four of these structures are designed to reference and embody classic sculptural San Francisco architectural elements, presented in a forward-thinking way. We referenced the geography and topography of San Francisco, and we were inspired by elements of the city’s rich maritime history. All of these structures are designed to integrate and adapt with technology as it develops, keeping their aesthetic relevant for many years to come. Above all they should be well-designed, easy to service, maintain and use. It is important for public toilets to be recognizable from a distance yet feel at home anywhere in the city. Distinct textured metal surfaces and curved façade indicate their purpose, whether for way-finding or use of the facilities. Rather than just fulfilling a single purpose, these iconic structures offer additional affordances on their exterior. On both the single and double toilets, the curved ends create a sense of place for tourists and attendants, while discouraging loitering. Everyone should feel that these toilets are comfortable, safe and hygienic; a small threshold around the entry allows users to transition from inside to outside with composure. The perforated metal facade on the sidewalk and street side of the structure allows passive and active ventilation and can be illuminated with neighborhood specific digital signage and/or graphics. The interior color and lighting can be adapted to reflect the diversity of San Francisco’s eclectic districts. Capped in soft arcs with an embossed ‘San Francisco’, the bold triangular based kiosks rise from the sidewalk with purpose and place. 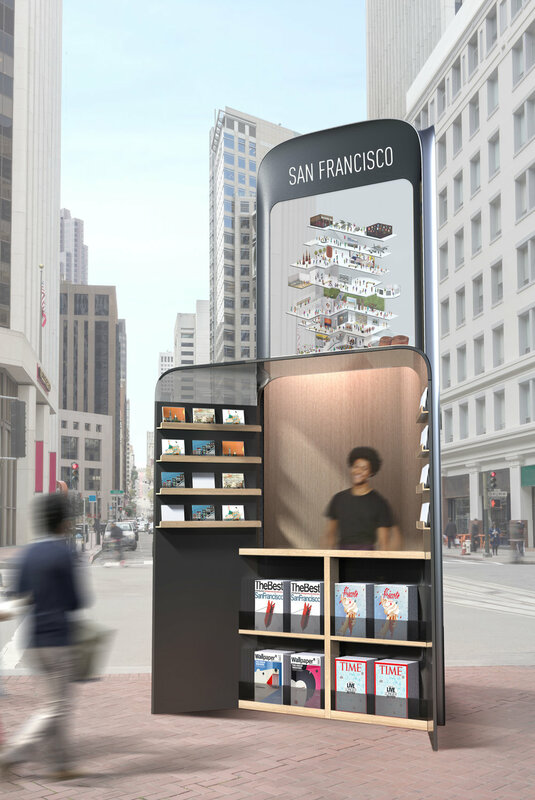 On the Advertising Kiosk, the street side panels face traffic as it’s coming and going while the remaining side faces inward to the sidewalk with PSAs and curated content from the San Francisco Arts Commission. The Multi-Function Kiosks look just as good closed as they do open. When the doors open to swing out 120° degrees, they extend the street-facing surfaces of the structure, and blend seamlessly into the awning. The interiors can be customized with materials and colors to present the business inside in the best light. It should be a pleasant experience to view from a distance, approach and eventual engage with the small business occupying the structure.